During a G8 meeting, the director of the IMF is found dead under suspicious circumstances. For an event that wreaked - and, indeed, continues to wreak - universal financial and social damage, the global recession, along with its various symptoms and causes, has received scant cinematic representation. Primarily the jurisdiction of worthy Oscar fare and damning documentaries, the so-called financial crisis has given rise to occasional dramas such as The Big Short and Margin Call, and docs like professional gob-shite Michael Moore’s Capitalism: A Love Story. But these sporadic (and star-studded) exceptions aside, such contentious subject matter has failed to engage with mass audiences. And why should it? The horror of the crisis, its continual fallout (the cuts, the property market, the toxic scapegoating: simply typing this is making me feel queasy) makes for a raw night out, and, perhaps accordingly, escapism is on the rise instead. Maybe this is where the genuine cinematic response to the crisis can be located, in the shift towards popcorn and pleasure. After all, how can the occult financial wrangling of a bunch of shady white guys in suits, the insular Polari of ftses and LIBORs, hope to compete with fast cars and massive robots fighting? (of course, our latent fears surrounding the outcomes of the crisis were, as ever, sublimated into genre film; remember how such films as Paranormal Activity and Insidious built their horror upon uncertain domestic terrors, as if to reflect the newly minted dread of being a homeowner during the crash?). 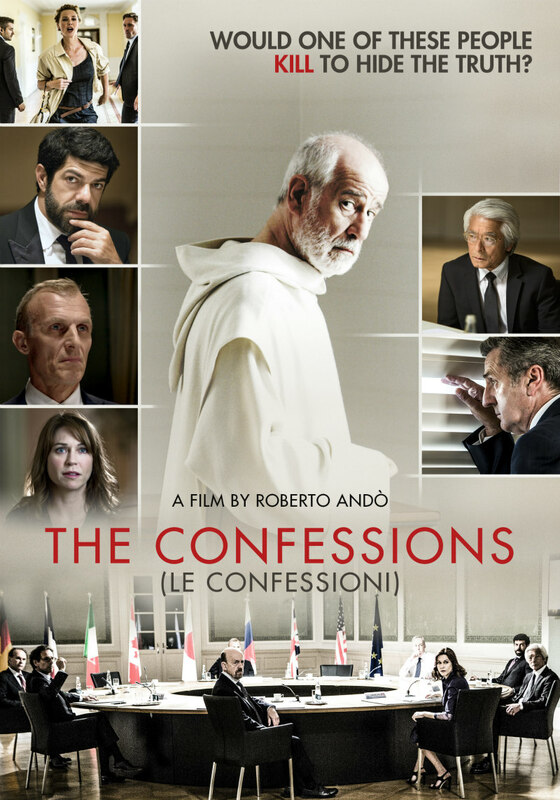 Roberto Andò and Angelo Pasquini’s international thriller The Confessions sets its sights upon the architects of the crisis, taking as its premise a G8 meeting located at a German hotel upon the coast. Within the edifice’s luxurious interiors, a select bunch of the world's most influential economists conspire to shape global financial structures. The guests are an intercontinental bunch, with Brits, French and Americans among the party, along with an interloper: the enigmatic Italian monk Salus (Toni Servillo). 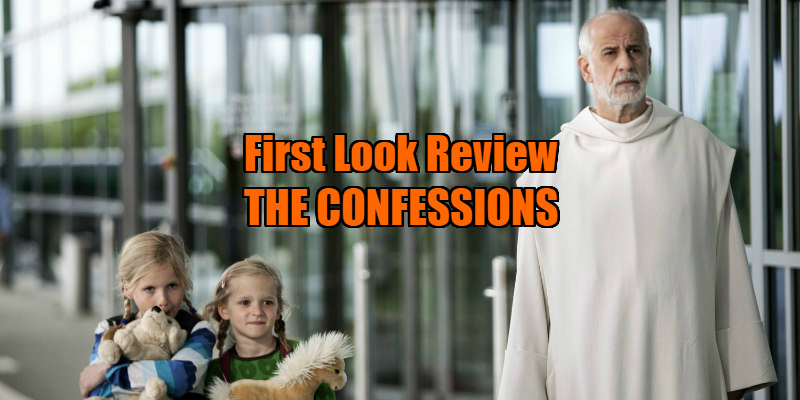 The monk has been encouraged along by none other than the director of the International Monetary Fund, Daniel Rochè (good old Daniel Auteuil), who would appear to be wrestling with the moral implications of his job; and, under cover of the night, Salus receives Rochè’s confession. However, Salus finds himself under suspicion the very next morning, when Rochè is found dead as an apparent suicide-yikes! The Confessions makes its political bias clear, with the G8’s remit explicated as ‘preserving the machine of capitalism’, and, more fatally, ‘like the mafia’; a group which answers to no one, shifting capital about like a child with an abacus. The covert nature of this shifty political forum is rendered in deluxe surroundings composed of the hotel’s mahogany furniture, thick linen and plush carpets, a sumptuous iconography that connotes immediate social privilege, and is thematically reinforced by a bold colour scheme of red and white standing stark against inky, suggestive shadows. Salus’s comparative purity is deliberately oppositional: his lack of materialism, openness and spiritual nature at odds with the clandestine environment. Indeed, this man of God is the only working link to the outside world, aside from pointed cutaways to televisions which broadcast various protests, and, in welcome light relief, the streakers who break in to the compound to demonstrate their approbation. Within the film Salus is a gnomic observer of the party’s intrigues, its whispered threats and regrets, as they in turn use him as a sounding board; the ‘confessions’ of the title. Refreshingly, a figure associated with the Roman Catholic Church for once isn’t the villain and instead, within this restrained polemic against the excesses of capitalism, the monk’s holy patience suggests a spiritual paradigm beyond the petty machinations of the cohort. Following Rochè’s suspicious death, the hotel is placed on lockdown, and, as the Herrmann-esque score and explicit references to Hitchcock imply, The Confessions’ narrative aspires towards a thriller in the mould of the Master. Hitchcock typified cinematic suspense as a form of intense dramatic irony: when the audience is aware of potential dangers that the characters are ignorant of, using the illustrative example of a ticking bomb beneath a table where two people talk, an explosive device that only the audience can see and hear. The problem is that in The Confessions, there is no bomb, metaphorical or otherwise, just endless dialogue and handsome photography with little sense of urgency. Flashbacks make us gradually aware of Rochè’s decisions, so we’re really in no doubt as to what actually happened, leaving the remainder of The Confessions to ponderous condemnation of the G8’s actions and its ongoing shirking of accountability. Furthermore, the film’s Manichean ruminations upon the nature of the free market and fiscal responsibility is in the main as superficial as its glossy mise-en-scene; anyone with a passing interest in the topic would have heard the hoary arguments already, and the rest of us are unlikely to be swayed by the film’s broadness. Perhaps the actual reason for the financial crisis’ lack of satisfactory representation is that its byzantine tedium renders it un-filmable? In any case, The Confessions’ denouement hinges upon an equation formulated by mathematical wunderkind Salus, a calculation designed to expose the unsustainability of the cabal’s intentions. However, instead of dicking about with figures, perhaps Salus’ time would have been better spent writing a script comprised of an intelligent drama more befitting of the otherwise rich cinematography, earnest performances and pure intentions of The Confessions.